Hey Jim Ross, is a hot dog a sandwich? Ross, at age 66, shows no signs of slowing down. Still under contract with WWE, Ross also hosts a weekly podcast, sells a line of barbecue sauce (I like it a lot, actually), is lead announcer of New Japan Pro Wrestling’s AXS-TV broadcasts, and does a live show in which he regales wrestling fans with stories from his nearly 45-year career (his forthcoming show on Aug. 23 at Zanies Rosemont outside Chicago features his longtime broadcast partner, Jerry “The King” Lawler). Still, as busy as he is, Ross dropped everything for The Takeout recently to answer this most confounding of questions. 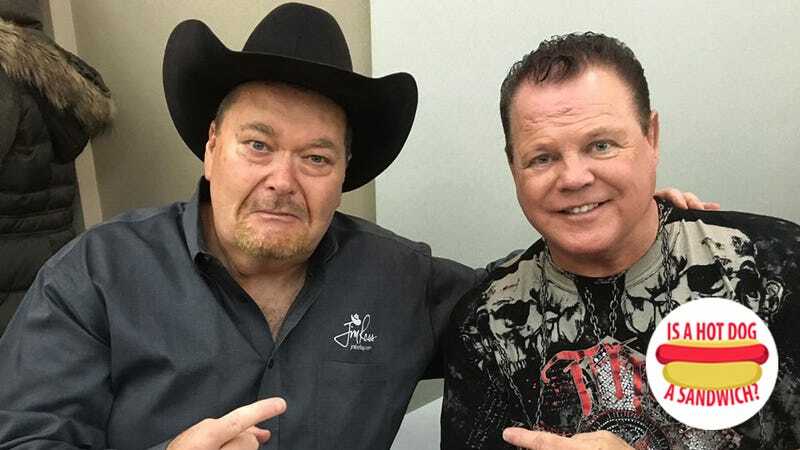 Jim Ross: Don’t fall for the “two slices of bread having filling in-between” un-American rhetoric that’s merely a culinary diversion by malcontents. Hot dogs are related to sandwiches by marriage and not by DNA.